Our services include complete in-house programming capabilities from simple existing needs analysis to very detailed analysis of existing space constraints and future growth projections. Programming translates directly into functional facility planning and helps define, document, and detail space requirements relative to proposed relationship diagrams. Our experience in complete master planning and environmental studies includes maximizing highest and best use, mixed use zoning studies, parking, traffic, and circulation studies, Floor Area Ratios, as well as complete project management services through construction. We have completed site master planning for clients throughout Southern California. Mr.Holliday has been a Principal Architect on Master Plan projects for the University of California at Santa Barbara, the SB Bowl Restoration, and the County of Santa Barbara. Our expertise in complete architectural, structural, mechanical, electrical, fire, life safety, and code analysis includes evaluations of existing structures for adaptive re-use and renovation. We offer the ability to draft and recommend alternative solutions for our clients who need to make the best decision in order to meet their company’s business objectives. Utilizing our “hands on” experience in specific projects and the most sophisticated construction cost estimating/programming consultants available, we help coordinate, review, and interpret the construction cost estimates of projects. We recognize the importance of cost control and have a strong track record of providing functional yet aesthetically pleasing projects within budget. JM Holliday Associates provides interiors design services for a majority of their projects. The firm strives to create an appropriate blend of interior and exterior architecture which represents an integration of the clients’ functional needs on the interior with the aesthetic and architectural concerns of the exterior. Recently completed projects which Mr. Holliday oversaw as a Principal with DesignARC included the UCSB Manzanita Village Student Housing Project, Westmont’s Founder’s Dining Room Facility, SB Bowl El Balcon Interiors, Santa Barbara City College Executive Dining Room and the Hayward Design Center. Our team has substantial experience in complete interior design including selection of all Furniture, Furnishings, and Equipment (FF&E). The coordination and specification of the furnishings, fixtures, and equipment are one of the most important aspects of an interior design. Our interiors staff has the experience and resources to help the client make educated decisions regarding selection of interior furnishings, fabrics, material patterns, and colors. In addition, we have experience in the design and specification of video satellite linked projection and interactive teleconferencing facilities. Our experience in substantial and complicated projects has given us insight to many of the construction problems which arise in the field. Careful attention to detail in field observations, job directives, change orders, and administration of the construction process is very important to our project management success. Our goal is a team effort of client, architect, and contractor working together to accomplish a quality project, built on time and within budget. 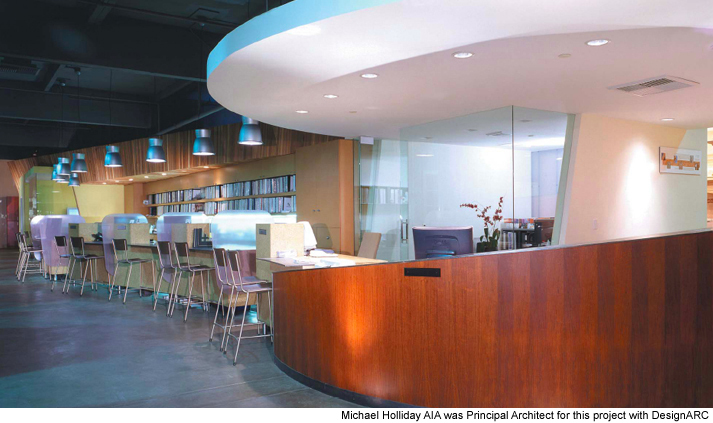 JM Holliday and Associates provides sustainable design and LEED consulting services aimed at high performance projects that are environmentally responsible, profitable, and healthy places to live and work. Mr. Holliday has been interested in environmentally responsible design for over 20 years since receiving his Master of Architecture degree in Architecture & Environmental Design in 1983. His work and his firm continues to pursue environmentally sensitive projects of uncompromising design. JM Holliday Associates strives to incorporate principles of green design into every project, and we are passionate about blending great design with sustainability.